The history of the Irvington district dates back to the Gold Rush era of the 1840’s when the first settlers arrived at Mowry’s Landing on the edge of San Francisco Bay. “The Corners”, later Irvington, was the home and work place for many early residents including John Horner, Earl Marshall, and Origin Mowry and quickly became a significant South Bay agricultural and commercial activity center. Wheat grown here was exhibited at the 1853 New York World's Fair, according to local historians. The area's first business is believed to have been a shop for farm machinery around which other small shops eventually sprouted. These early settlers had the foresight and spirit to realize the future potential of the Irvington area. Washington College, Alameda County's first school of higher learning, opened in Irvington in 1872 and later became a military academy when other colleges were established in the East Bay. As Irvington grew, its Five Corners area, the convergence of Fremont and Washington Boulevards and Union and Bay Streets, came to be considered the heart of the 108,000-acre Washington Township. It was the collection of five of Washington Township's seven districts – Irvington, Niles, Warm Springs, Mission San Jose, and Centerville – that incorporated in 1956 into modern-day Fremont. Nobody can be sure how Irvington gained its name. One story has it that it came about because of a mistake by the local railroad. The district carried various names including The Corners, Washington Corners and Irving. Residents, according to local historians, may have actually settled upon the name Irving, but the local railroad erroneously printed schedules that read "Irvington" and the name stuck. The area's most recognizable marker, the Irvington Monument, located near the Five Comers, was first erected in 1917 by R.A. and Lee Griffin and our antecedent organization, the Irvington Chamber of Commerce. It was originally built in the middle of the road to help direct traffic at Five Corners - something like a turn-of-the-century, traffic light. Because of its role, it was physically more imposing than appealing but it stood defiantly for over 40 years. In 1963, it was deemed to be obsolete by the city administration and was unceremoniously removed and dumped behind the Centerville Fire Station. 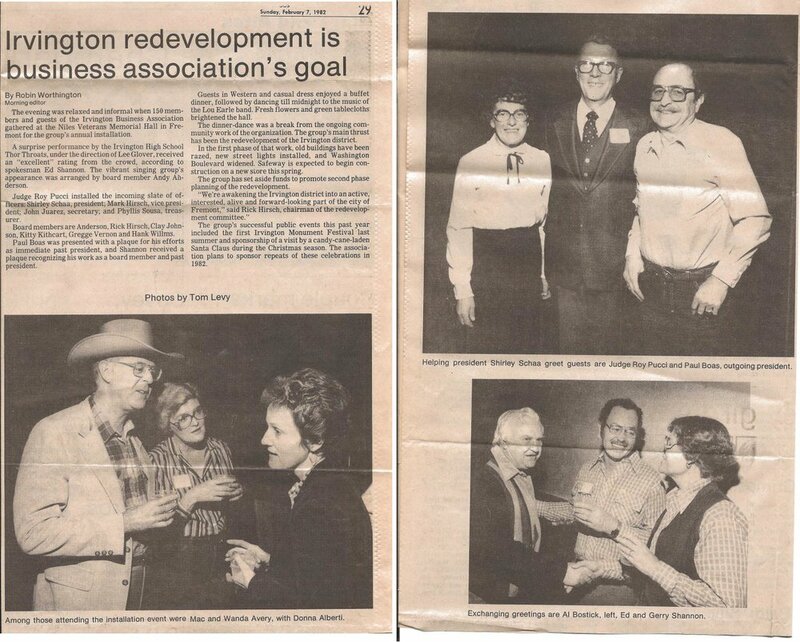 However, in 1978, largely thru the efforts of the Irvington Business Association it was resurrected and permanently placed in the Irvington Park to once again stand proudly as the symbol of Irvington’s spirit. Irvington now, as then, aspires to retain this same spirit. 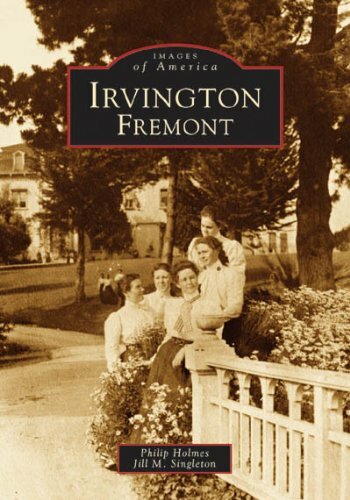 Learn more in this wonderful book on the Irvington District of Fremont, written by local historian Philip Holmes and Jill M. Singleton. A found article from 1982!